The large blob was found in a drain in west London. 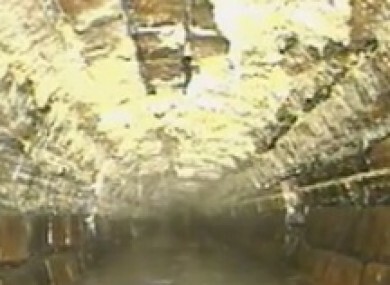 Screengrab of vidoe footage of drain workers looking for fatberg in London sewer. A MASSIVE LUMP of fat, sanitary products and wet baby wipes – known as a “fatberg” – has been pulled out of a drainage pipe in London. The Guardian reports the 10-tonne mass was discovered in a sewer in Chelsea, west London. Believed to be 40 metres long, it’s reported the 1940s pipe broke from the sheer weight of the blob. So, what does it cost to remove something of that size? Thames Water reportedly spent £400,000 hauling out the giant toxic fatberg, taking more than two months to do so. Formed when household waste like tissue, sanitary products and fat combine, the fatbergs are becoming a problem for London’s sewers. Wet wipes cling on to the fat that is poured down drains. The fat hardens when it arrives in the cold drainage pipes and becomes a large, hard mass. In 2013, the largest ever recorded fatberg was dredged out of another drain in London – this one weighing in at 14 tonnes. Email “Think before you flush: 10-tonne fatberg removed from London sewer ”. Feedback on “Think before you flush: 10-tonne fatberg removed from London sewer ”.